Designer Jane Schwab goes for the gold, combining a sunny quilt with amber glassware at this summer affair. As the longtime co-owner of Charlotte, North Carolina-based Circa Interiors & Antiques (circainteriors.com), designer Jane Schwab maintains an enviable reputation for fashioning elegant, approachable Southern spaces both indoors and out. She applies this same gracious philosophy every time she sets the table for friends and family. In her view, the ideal June afternoon includes throwing open the French doors and prepping her loggia for a festive affair. An eye-catching Indian quilt was her inspiration for this particular early-summer event. Its happy yellow hue—punctuated by white and gray—proved perfect for this sunny time of year. Wall paint: Palace White (956); benjaminmoore.com. Flowers: Parrot tulips, coral bell leaves, viburnums, and roses by Jay Lugibihl; inbloomltd.com. Chairs: Watson Chair; www.munder-skiles.com. 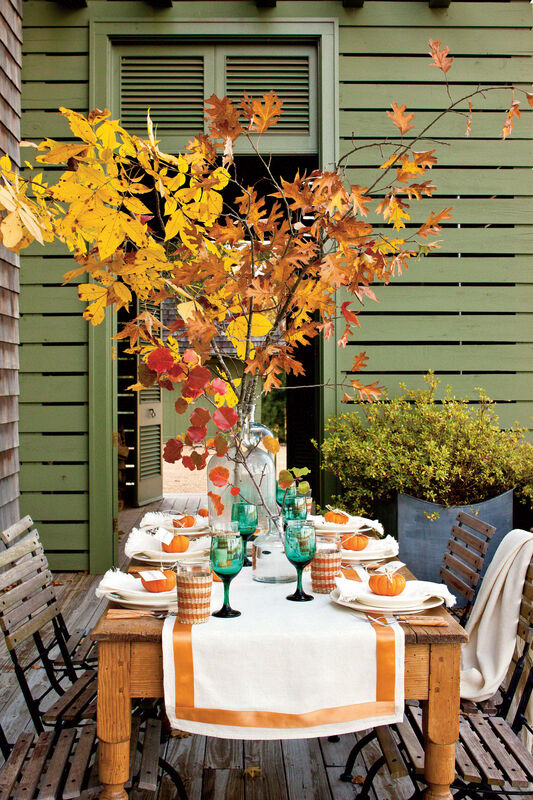 Ground an outdoor setting with layers of natural materials, such as these wood chargers and hand-thrown plates. For sophistication and crispness, Jane added hemstitched linens and silver-plated flatware and cups. "The mix of polished finishes and casual textures is very appealing," says Jane. "It's the high-low combination that makes things so fun." Chargers: Groove Wood Charger by Roost, flatware: by Aubry-Cadoret, napkins: Signature Dinner Napkin with Medallion Monogram by Julia B. (juliab.com), all available through Circa Interiors & Antiques; circainteriors.com. Dinner plates: Seagate Plate in Grey; canvashomestore.com. Salad plates: Citrange 8" Salad Plate; soulestudio.com. 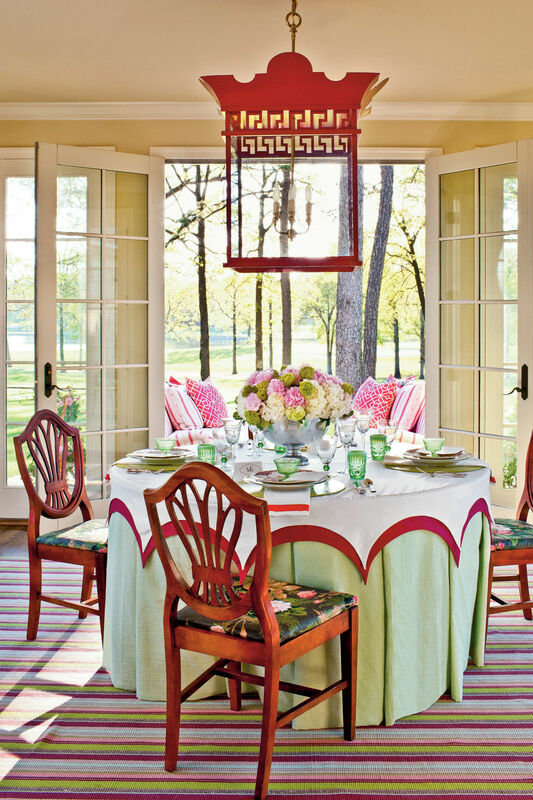 When placed beneath the kitchen window, an outdoor folding table that usually lives on Jane's screened porch becomes an instant bar and buffet. A pair of amber-hued hurricanes casts a soft glow and brings the golden color palette to the side table, while a spread of snacks served in a mix of chic serving pieces attracts all the party guests. Wicker carafe: Campagnard Small Carafe, available through Circa Interiors & Antiques; circainteriors.com. Hurricanes: For a similar look, try John Rosselli & Associates (johnrosselli.com), available through DCOTA; 954/921-7575. Sumptuous layers make an outdoor table look indoor luxe. To place beneath her patterned Indian quilt, Jane added a floor-skimming burlap table skirt that she lined and trimmed just as she would an indoor window treatment. Tablecloth fabric: by Manglam Arts, available through Circa Interiors & Antiques; circainteriors.com. Jane's take on candlelight? More is more! "Don't be shy when it comes to candles," she says. "A dozen or so flames may seem like overkill at first, but that handsome flickering can add such festivity to a dining table at night." One of her favorite tricks is to substitute etched glasses, such as these by William Yeoward Crystal, for votives. Rattan tray: available through Circa Interiors & Antiques; circainteriors.com.